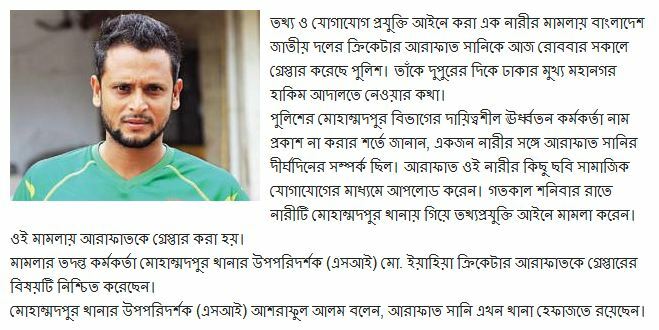 Bangladeshi cricketer Arafat Sunny has been arrested field in ICT cased by a women. Police said, Arafat Sunny’s ex wife field the case while he upload some photos in Facebook social media. Today 22 January, 2017 Sunday enforcers detained Sunny from Dhaka’s Aminbazar area on Sunday morning and took him to Mohammadpur Police Station. Dhaka Metropolitan Police additional deputy commissioner (media wing) Md Yusuf Ali confirmed the matter. His ex wife field the case last night Saturday (21 January). And today he is arrested by the police. The details news will update soon. The 29-year old cricketer played 16 One Day Internationals and 10 T20 international matches for Bangladesh. arafat sunny wife. arafat sunny and his wife. Next articleBig Bash League Today Match Predictions | BBL T20 2016-17 Who will win?